What are the implications for agriculture under a proposed climate bill? 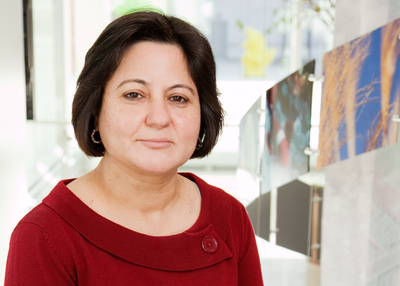 Agricultural economist Madhu Khanna is an expert on environmental policy. Congress is considering a climate bill that would set the nation's first-ever mandatory limits on heat-trapping gases in an effort to curb global warming. Agricultural economist Madhu Khanna, an expert on environmental policy, discusses the potential consequences for the nation's farmers in an interview with News Bureau Business & Law Editor Jan Dennis. What are the implications for agriculture under the climate bills now floating in the House and Senate, which propose a cap-and-trade system to curb carbon emissions? As it stands, agriculture is excluded from the caps, which would focus largely on reducing carbon emissions of major energy producers such as power-generating plants and fuel refineries. Still, those caps would lead to higher energy prices - and therefore higher fuel and fertilizer prices - which would raise farm-production costs. At the same time, farmers could benefit from market-based payments for offset activities that sequester greenhouse gases, such as no-till farming or installing digesters that capture methane on livestock farms and convert it to electricity. They would also benefit if higher fossil-energy costs create even more demand for renewable energy and biofuels, raising prices for corn and other commodities. As a result, there could be a significant net increase in farm income because of the climate bill; some studies estimate that with carbon prices in the range of $30 per ton of carbon-dioxide, the agricultural sector could benefit by as much as $8 billion to $13 billion per year. Do you foresee a dramatic increase in biofuel demand if the climate bill is approved? The climate bill will create incentives for production of low-carbon biofuels. But our research indicates that a fairly high price on carbon emissions would be needed to really stimulate demand for second-generation, cellulosic biofuels, the ones with a greater potential to reduce greenhouse-gas emissions per gallon used than corn ethanol. This is because cellulosic biofuels are currently very expensive to produce, so the price of carbon would have to be $50 or $100 per ton of carbon dioxide, not the $15 to $30 forecast under the climate bill. But technology is continually evolving, and if production costs come down they do offer significant potential to raise agricultural incomes and reduce greenhouse-gas emissions. Currently, biofuels mandates under the federal energy bill of 2007 that call for 15 billion gallons of corn ethanol by 2015 and 36 billion gallons by 2022 are expected to drive demand for biofuels in the short term, not the climate bill. While the expected carbon price might not be high enough to stimulate cellulosic biofuel production for transportation, it could go a long way toward increasing demand for biomass to generate electricity. Coal is currently very inexpensive but very carbon intensive, so even a small price on carbon could create demand for agricultural-based energy sources to complement other renewable energy alternatives to coal. Moreover, the climate bill proposes to establish a Renewable Portfolio Standard that would mandate a percentage of electricity be produced from renewable sources. This would create additional market opportunities for agricultural residues and dedicated energy crops as inputs for co-fired electricity generation. Is a cap-and-trade system that targets major energy producers the best approach to combat global warming? A cap-and-trade system imposed on energy producers is easier to administer than one imposed on energy consumers. From an efficiency perspective, however, either approach will have the same effect of raising the price of energy based on its carbon intensity and leading consumers to find the least costly ways of reducing energy use and, therefore, carbon emissions. A cost-effective cap-and-trade system would be one that caps all sectors of the economy, rather than leaving some sectors uncapped. This would create incentives for all sectors to find the lowest cost solutions to carbon emissions and lower the costs to the overall economy of meeting the cap. The climate bill does create some incentives for the uncapped agricultural and land-management sectors by rewarding carbon offsets generated by adopting practices that curb greenhouse-gas emissions. It is, therefore, a step in the right direction. But leaving land management and agricultural activities outside the cap could result in foregoing some opportunities for low-cost carbon abatement while also allowing for carbon leakages from land-use changes.